At the Jean Vollum Natural Capital Center, customers and visitors encounter a wide range of environmentally and socially responsible goods, services, and ideas. Our community includes governmental, business and non-profit groups gathered around the themes of sustainable forestry, farming, fishing, green construction, community building, and socially responsible investing and financial services. Retail tenants surrounding a public atrium. 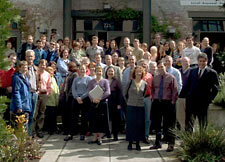 Cascadia Region Green Building Council - The Cascadia Region Green Building Council is one of three original chapters of the U.S. Green Building Council. Incorporated in Oregon in December 1999, the chapter covers Oregon, Washington, and British Columbia, but also includes members from as far away as Idaho and Montana. Cascadia continues to serve its members by helping the U.S. Green Building Council meet its goals in the Pacific Northwest. Hot Lips Pizza - A Portland favorite, Hot Lips uses local, organic and seasonal ingredients to make some of the best pizza on the planet. They even brew their own soda pop, like Raspberry. Laughing Planet Café - Dedicated to making wholesome food in the forms of burritos, bowls, salads, smoothies, juices and homemade cookies. Patagonia - Environmentally conscious makers of quality outdoor clothing, Patagonia is known for its recycled fleece and organic cotton garments and support of grassroots environmental groups. Pearl Health Center - Offering an innovative approach to health and wellness by emphasizing the appropriate use of conventional and alternative medicine, Pearl Health Center has Chinese, naturopathic, western and chiropractic medicine as well as massage therapy and mental health services. Office tenants, a public mezzanine space, and a conference center for business and community events. The Bill Healy Foundation - The Bill Healy Foundation is a public non-profit with a dual focus: supporting environmental conservation and the well-being of children. Billy Frank, Jr. Conference Center - An 1,800 sq. foot event space with state of the art audio-visual capacity, the conference center is designed to invite community and business groups to the Natural Capital Center for events that promote and encourage a conservation economy. Ecotrust - A Portland based non-profit organization dedicated to encouraging a conservation economy along North America's rain forest coast, Ecotrust has been acclaimed for its "pragmatic idealism" and for finding economic solutions to environmental and community problems. Ecotrust Forest Management - is dedicated to the principles of ecological forest management that emphasize diverse, uneven-age forests with clean water and air, and bountiful wildlife habitat. EFM is a wholly-owned subsidiary of Ecotrust. Naito Development - Information coming soon. Portfolio 21 Investments - With offices in Portland and Seattle, Portfolio 21 helps thousands of private clients to discover the benefits of investing intelligently and responsibly. Sustainable Harvest - The leading North American importer of organic, shade-grown, and fair-traded specialty grade coffees, Sustainable Harvest imports from small family farms in Asia, Africa, Central and South America and sells to specialty coffee roasters and natural food supermarkets in the U.S. and Canada. Upstream21 - Upstream 21 is an Oregon corporation, based in Portland, that was formed in 2004 to put financial and other resources to work in successful, privately held small companies and help them improve their financial, social and environmental performance. Two offices overlooking a terrace made of FSC-certified wood and surrounded by an "ecoroof," a rooftop planted with hearty vegetation to absorb and filter stormwater. Wild Salmon Center - Dedicated to research and conservation of wild salmon, trout, steelhead, and their ecosystems along the Pacific Rim, the Wild Salmon Center works to protect the last, best places for these native fishes.